Mansions of the Gilded Age: The Demolition of Inisfada, One of the Greatest Mansions in America. The former home of Nicholas and Genevieve Brady at Manhasset, New York. Please read the post for links, photos and floor plans. The Demolition of Inisfada, One of the Greatest Mansions in America. The former home of Nicholas and Genevieve Brady at Manhasset, New York. Please read the post for links, photos and floor plans. It is with great sadness that Inisfada is in the process of demolition as of today. I never thought it would come to this. I received notification almost two years ago about the closing of the building and many, many groups, historic organizations and articles in the print and online media brought attention to it's endangerment. I was fortunate enough to have seen the house a few times in past years and once had a basement to attic tour. I have been in many mansions over the years and while all are different and beautiful in their own way, Inisfada was truly unique and a national treasure, worthy of the status of Biltmore, Hearst Castle and many of the Newport houses. 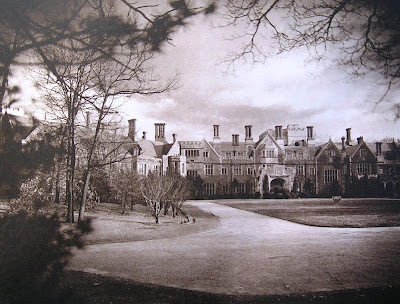 When I attended school at the New York Institute of Technology in the 1970s, I would often drive all over the Gold Coast and search for the mansions that still existed. Today so many of those that were left even at that late date, are now gone. Fortunately Inisfada was a well documented house that appeared in books and magazines and I have many photos of the house in it's heyday. I know I have seen a plan someplace, but I have drawn a very crude sketch tonight from my memories there of the first floor. In time or if others had been there, please feel free to add to it or comment. I will continue to search for one and will try to mark up exterior views to identify the many rooms. It really is a shame that such a house could not have been saved for the public to enjoy or have been preserved for future generations. Ada Louise Huxtable said of the demolition of Penn Station which also applies here, "We will probably be judged not by the monuments we build but by those we have destroyed". Inisfada from the Entrance Drive. 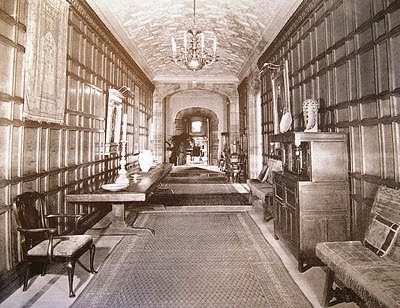 The Long Hall at Inisfada. Sketch of the First Floor plan of Inisfada. Click HERE for more photos and links about Inisfada. For those who have Facebook accounts, please ask to join the group, Mansions of the Gilded Age for more stories about Inisfada and to make comments, ask questions or just mourn this great loss with others who made web sites and tried to make the world and the local community aware of this treasure that should have been saved. Mansions of the Gilded Age has over 4800 members worldwide, which shows how many people love these rapidly disappearing architectural masterpieces.